A former New England Patriots player's beloved dog has been found dead. 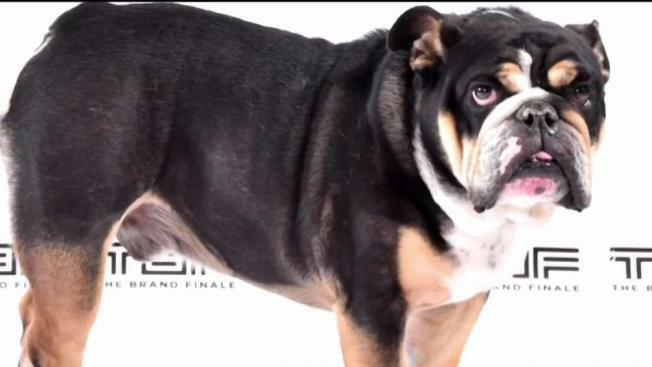 Knox, a 5-year-old English bulldog owned by former Pats linebacker Jerod Mayo, was found Sunday in the home of the dog's former trainer, according to the Rhode Island Society for the Prevention of Cruelty to Animals. "Obviously, our family is devastated. We kind of expected the worst, but hoped for the best," Mayo said Monday. "The kids — devastated. My wife, all of us, we are devastated. It's tough." Last month, Mayo told WJAR he had hired a trainer through Off Leash K9 Training in Providence. The trainer picked up Knox on May 24. When Knox was due to be returned several weeks later, the trainer told Mayo she had lost the dog while out walking with another dog in Wrentham, Massachusetts. Police searched the Joe's Rock conservation area off 1500 West St., but were unable to locate Knox. They did, however, find his electronic collar out in the open on the trail. The collar was in pristine condition and there was nothing to suggest that it had been removed forcibly. There was also no blood or fur near the collar and no sounds were heard that would indicate that Knox had become prey to another animal. According to Cranston police, the trainer, Amelia Ferreira, later changed her story, saying Knox was last seen in his crate at her Cranston home and then disappeared. The Rhode Island Society for the Prevention of Cruelty to Animals began an investigation and seized five Maltese dogs from Ferreira's home. The dogs were living in the basement, matted and dirty, according to the agency. "When it is all said and done, we look at Knox as a hero," Mayo said. "He saved some other dogs, that is the glass-half-full way of looking at it." The RISPCA said Knox died while in Ferreira's custody, and she is being charged by the Cranston Police Department with one count of obstruction for concealing evidence relevant to the investigation. Evidence showed that Ferreira had known the whereabouts of Knox's body for several weeks and intentionally concealed it from authorities. The police report said Ferreira told police she left her home on July 22 around 1:30 p.m. to go to a training session with another dog, leaving Knox in a wire crate with the air conditioning on. When she returned home between 5:30 and 6:30 that night, she found him dead. The next day, she told police she put the dog's body in a bag which she placed behind her shed in a long box. She later brought the bag inside and said she planned to place the blame on her estranged husband. But she changed her mind and decided to tell the truth. In an Instagram post Monday, Mayo said, "Unfortunately, the answers we prayed for regarding Knox aren't ones we were ready to face." He said Knox's body had been kept in a trash bag for the last two months. "We raised Knox like our child as you guys can see from our photos and those of you who know us," Mayo said. "It hurts to have to accept that our beloved Knox was thought of as trash as they saw our family hurting." On behalf of his entire family, he went on to thank everyone who helped search for Knox after he went missing. "We still have work to do.....we need to bring awareness to this problem so it never happens again," he said. "This is just getting started." The dog's cause of death is not yet known, and the RISPCA said additional charges relating to animal cruelty may be forthcoming.